Bobcats win their first game of the year 3-0. Rupp pitched a complete game shutout and had 13 strikeouts while allowing only 2 hits. Offense really struggled and all 3 runs were unearned. Hopefully the offense improves as the season goes on. TXST takes 1st game of 2018 Softball series with Texas-San Antonio 7 - 1. All of the runs came in one big inning. Big tourney at A&M this weekend. Ladies get a big road victory over #11 Baylor 5-2. Need a sweep this weekend to break into the top 25. Cats defeat #11 Baylor in Waco 5-2. Rupp struggled early but held it together and finished strong. Bats were silent until the 4th when molenaar singled. The 5 runs were scored during the 5th and 6th innings. This is a big win for the cats against a very good team. Cats sweep coasral Carolina. The final game was 10-0 with Rupp pitching a 6 inning no hitter. H. Mckay ended it with a grand slam. They should be nationally ranked when rankings do come out. They deserve it. Rupp pitching a 6 inning no hitter. #BobcatsWIN! Randi Rupp pitches the second perfect game of her career (fourth in program history) and the Bobcats remain perfect in @SunBelt play! Now hopefully they can beat the horns in their next game. Rupp should be fired up as she always is against UT. Cats sweep both games againsy S. Alabama 1-0 and 4-1. The first game went 13 innings and Rupp pitched the entire game. 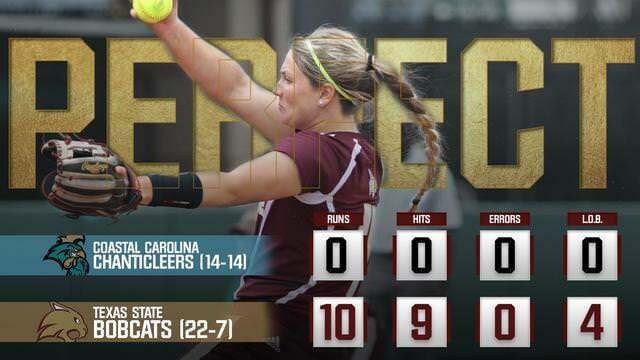 She went 13 innings allowing just 5 hits and walked 2 while striking out 21 batters.pretty awesome performance. she's a beast. #2 in strikeouts nationally. Have to think if we take 2 out of 3 in Lafayette we have a great chance of winning conference or at least picking up a share. But if ULL were to take 2 of 3 or sweep anything could happen at that point. Would this be our first regular season championship since joining the sunbelt in a major varsity sport? which are the ones that count. regular season is only for tournament seeding. Well he specifically asked about regular season championships. Volleyball won the sun belt tournament championship a couple years ago but did not win the regular season championship. i know - just pointing out that there is no reward or advancement for winning the regular season. you get top seed in the conf tourney, and that's it.